I have a new motto – and I think that this particular saying is going to save me a lot of stress, make me more productive, and help to return the enthusiasm to my life. It is – wait for it…Things are only as hard as you make them. You see, I’ve discovered that I’ve been making things much harder than they actually are – even simple things – and it’s sucking the joy right out of my life. For example, Thursday is my house cleaning day, and it usually starts out with me grabbing a third cup of coffee while sprawled depressively on the couch – half watching Live with Kelly and Michael and half saddled with the mental burden that I have to clean the house. Of course, its total nonsense, cleaning the house isn’t necessarily difficult and it doesn’t even take that much time but somehow I always choose to build it up in my mind like I’m setting out to run the Boston Marathon or something. It’s an illusion, a misconception – but I’ve acquired a terrible habit of doing it regarding almost everything. Whiney, whiney, whine. How did I become this way? It’s ridiculous. As a freelance writer I have more time now than I ever have – and yet I think I’m complaining more. And it’s not even that I’m lazy, while it may sound cliché, I guess I’ve just fallen into the habit of making “mountains out of molehills.” I suppose those old sayings always come from a place of truth – we’ve just learned to tune out the bigger message over time. But no more. The first step to recovery is realizing that you have a problem, and I am Marci the Mountain Maker. Or was. Because now I know – wait for it…Things are only as hard as you make them. The truth is, life is good, and even the mundane little “have to’s” are blessings – but I guess I haven’t been honoring them as such. But hey, if rediscovering my joy is as easy as a simple shift in perspective then I think I can handle that. 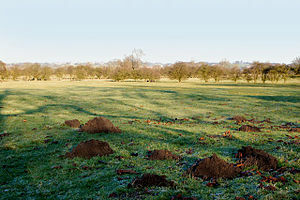 I will let my molehills remain molehills – or better yet, maybe I’ll make friends with the mole.